More than 230 people attended this 5-day/4-night convention from around the state. Santa Barbara Airbus co-founders/owners Eric and Kelly Onnen and their partner Mark Klopstein received the rosewood and crystal-etched commemorate plaque from Michelle Silvestro of National Interstate Insurance Company. More than 50 Santa Barbara AIRBUS employees including operations, drivers, maintenance and administrative staff were in attendance to celebrate the company’s honor. It was revealed after the award was given that Santa Barbara AIRBUS Charter Coordinator Daniel Butters had made the confidential winning nomination. 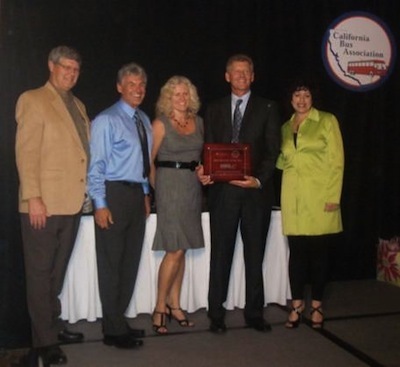 Presenting the California Bus Association (CBA) 2012 Outstanding Operator of the Year Award to Santa Barbara AIRBUS (left to right): Tom Giddens, CBA Board President; Mark Klopstein, Vice-President of Operations and co-founding partner of Santa Barbara AIRBUS; Kelly Onnen, Co-founding partner; Eric Onnen, CEO and co-founding partner of Santa Barbara AIRBUS; and Michelle Silvestro, Assistant Vice President of National Interstate Insurance Company, sponsor of the award. Eric Onnen and his wife Kelly Onnen, along with their partner Mark Klopstein, inaugurated their transportation service from Santa Barbara County to Los Angeles International Airport (LAX) on April 4, 1983. The company began with two, 10-passenger vans running 5 trips to/from SB/LAX from Monday-Saturday. Twenty-nine years later in 2012, Santa Barbara AIRBUS has a fleet of 19 deluxe motor coaches and 4 mini-coaches seating 21-to-25-passengers; and “The Black Pearl Limo Bus”. Services not only include 16 daily trips to/from SB/LAX; but also offer private Charter Bus Service, public Day Trips and Multi-Day Adventures. Santa Barbara AIRBUS started in the spare room of the Eric and Kelly’s Santa Barbara area condominium and after several moves for expansion, is now located at 750 Technology Driver in Goleta. The always locally-owned and operated business employs approximately 60 people; completes over 1.2 million miles annually; and now leases more than 53,000 square feet of fenced parking area, a 5,000 square foot office building and a 5,000 square foot state-of-the-art maintenance facility (pictured above). For more information, visit click here.